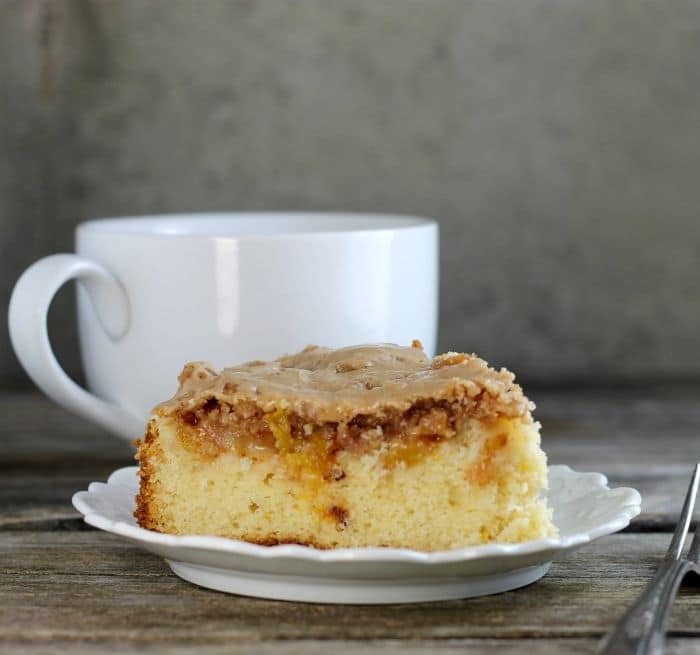 Fresh peach coffee cake is a soft moist cake topped with fresh peaches, crumble topping and icing. It is great to make on lazy Sunday mornings. 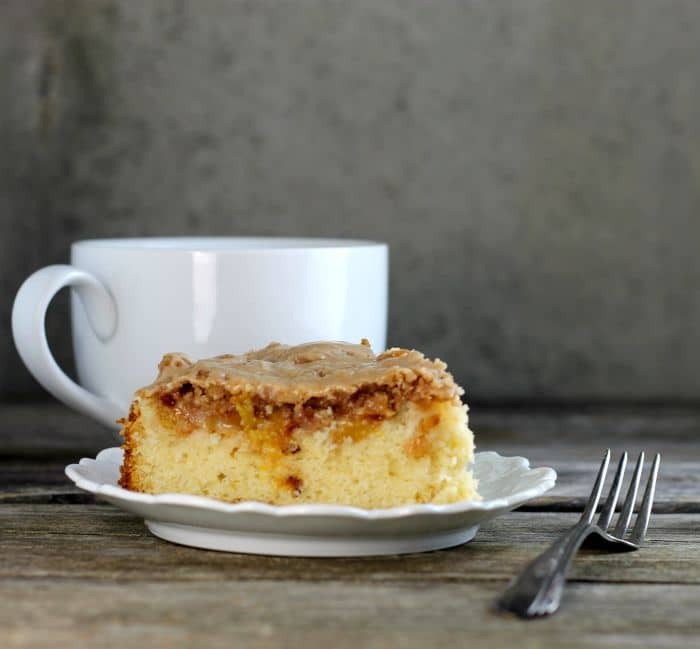 Fresh peach coffee cake is a basic quick coffee cake and goes great with a cup of coffee, tea, or a cold glass of milk. I just love these quick coffee cakes that can be whipped up, baked and eaten in under an hour. I have been making easy quick coffee cakes for as long as I can remember. It was a great treat for a Sunday morning when our kids were still living at home. I would make a large pan of any kind of quick coffee cake and it was gone before I knew it. Now that peach season is winding down I knew that I had to make a coffee cake with some of the summer’s delicious peaches before they are gone. There have been some really amazing peaches this summer. I have enjoyed just slicing them up and serving them fresh. I have taken some in my lunch for work and enjoyed every bite. It will be sad to see these fresh peaches disappear, but then there is always next year. If you have been around this blog at all you know that I love a good crumble. This coffee cake has a crumble, but I decided to top the crumble with a cinnamon and ginger icing. The cake, peaches, crumble, and icing comes together for a delicious breakfast treat or an afternoon snack. I hope you try this fresh peach coffee cake before the end of the peach season. 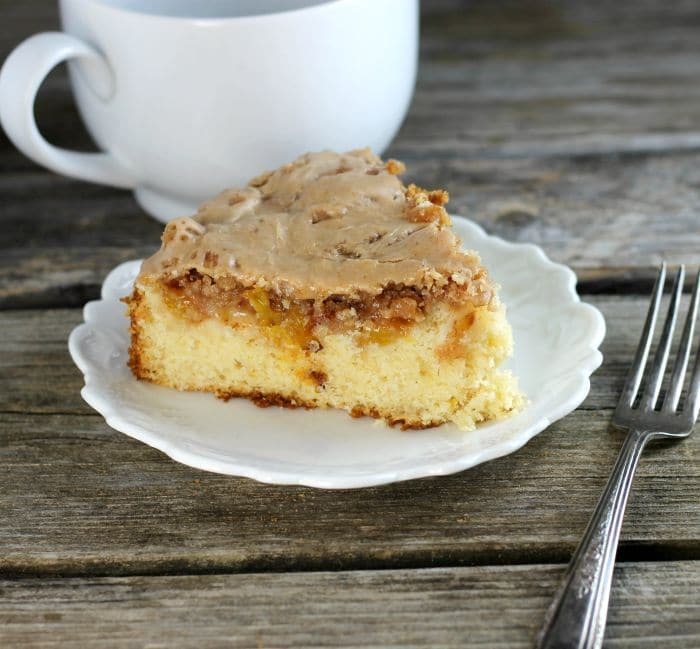 Fresh peach coffee cake, is a soft moist cake topped with fresh peaches, crumble topping, and icing it is great to make on a lazy Sunday mornings. Preheat the oven to 350 degrees F. Grease an 8-inch spring-form pan. Cream together the 1/4 cup butter, 1/2 cup sugar, and 1/4 cup brown sugar with an electric mixer. Sift together the flour, baking powder, and salt. Mix the egg, milk, and sour cream. Alternating the flour mixture and the egg mixture mix in ending with the flour. Spread the mixture in the prepared pan. Peel the peach and cut into small pieces. In a bowl combine the peach, 1 tablespoon sugar, and 1/4 teaspoon cinnamon. Mix well and set aside. For the crumble topping mix together the 1/3 cup flour, 1/2 cup sugar, 3/4 teaspoon cinnamon, 1/4 teaspoon ginger. Add the butter and cut in until small crumbs form. Spread the peach mixture over top of the cake batter. Sprinkle the crumble topping over top of the peaches. Place in the preheated oven and bake 35 to 40 minutes. Test with a toothpick, if it comes out clean remove from the oven. Set on a cooling rack until completely cooled. For the icing combine the 1 cup powdered sugar, 1/2 teaspoon cinnamon, and 1/4 teaspoon ginger. Add enough milk to the correct consistency for drizzling over the top of the crumble. You must have known that I just bought a couple of kilos of stone fruit :-)) Your coffee cake looks amazing, Dawn. looks really delicious Dawn ! love all cakes with fruits ! 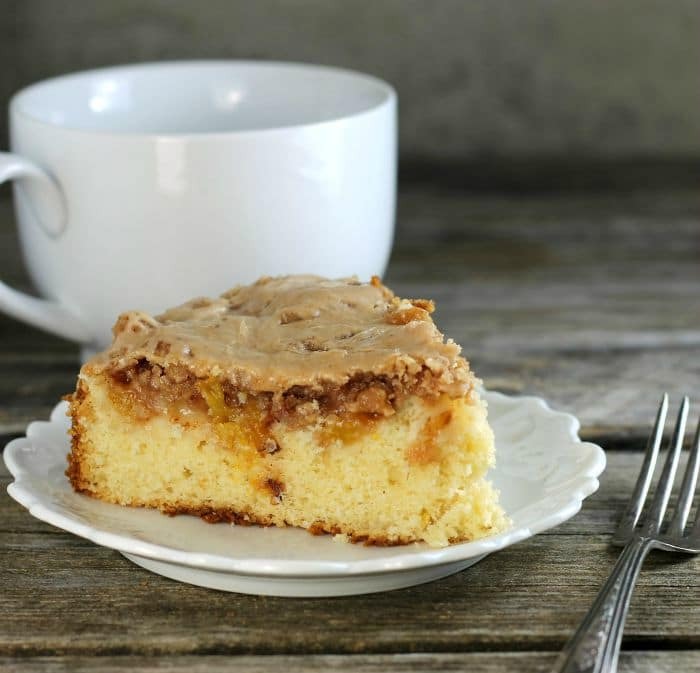 Fresh peach coffee cake.. yummy… Thanks for sharing your recipe.. Can’t wait to get my hands on it.. I just love a good fruity coffecake! Bonus points if it’s easy to make! This looks extra delicious with peaches and the crumble topping – my favorite too. What is a coffee cake without the crumble. lol This looks absolutely amazing! What a great use for the end of summer peaches! This is wonderful. It looks like pure comfort food. I love peach desserts – they’re just off the beaten path enough to be really refreshing. The topping also sounds good. I like the ginger. This cake looks amazing, the ginger really gives it an interesting twist. This cake looks so good! Ginger really gives an interesting twist.